← So what's Todd McFarlane up to these days? Wolverine. Number 34. Update of the brown costume. Much needed. Actually, this figure is much more interesting than that blasé attitude would lead you to believe. 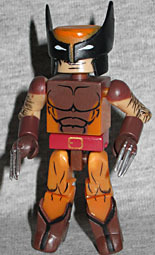 This is only the second brown Wolverine there's been, and the details are painted well - even continuing around the sides and on the back of the legs! He gets the new, thinner boot-fronts that Dokken Daken had, a big chunk of black hair that was new at the time, nice thin claws, and a "pulled back" mask like the Captain America Through the Ages set introduced. He has a katana molded in red, meant to represent the healing-factor-negating Muramasa blade. While it's true for most of his adult life Magneto has been one of the most feared beings on the planet, there was a time when he was a force of good and lead the X-Men in Professor Xavier's absence - this is not one of those times. During his darkest days Magneto has wanted nothing more than the annihilation of the human race. Though this set wasn't marked as such on the packaging, it was a TRU exclusive: only one of the sets in Series 9 was available elsewhere, and this wasn't it. The other sets were meant to complement the New Mutants and X-Force boxes, while this one is clearly meant to go with Series 34's Jim Lee X-Men. Wolverine in his brown costume and a super-evil Magneto? That's straight from the cover of X-Men #1! 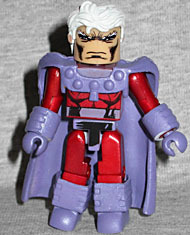 The figure is painted a metallic red, and gets many of his add-ons from Age of Apocalypse Magneto: the boots, gloves and helmet all come from that figure (though the handguards have been cut off at the factory). 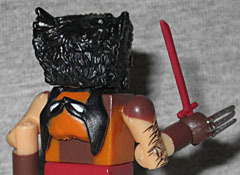 Though his cape/collar combo is similar to the AoA toy, it's a completely new mold. There's a second head in the tray, featuring a blackened, shadowy face with red eyes and white teeth. It looks a little silly if you put Maggy's white hair on it, but when staring out from inside his helmet, it looks very threatening! We get two black hands, meant to be used inside the two pink energy effects for a stronger contrast. Finally, there's a clear flight stand, so this villain can hover menacingly. It only has one footpeg, which is good: the bulky leg armor keeps his feet from getting next to each other. I bought this set based purely on the strength of Rustin's review - though I didn't buy two of it, because I understand how "toys" work. So do I. More than I thought I would. 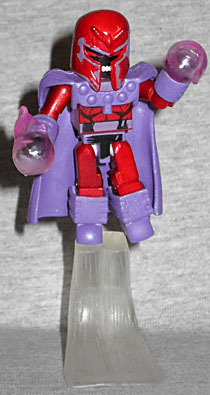 Evil Magneto sells it!